A stunning mid-game turn-around that erased a two-goal deficit with five unanswered goals enabled the Terriers to keep their season and Coach Jack Parker's behind-the-bench career alive for at least another day. In what might best be described as "A Tale of Two Hockey Games," BU gave its coach and fans a come-from-behind 6-3 win against arch-rival BC. Freshman Danny O'Regan (#10) and sophomore Evan Rodrigues (#17) led the way with two goals apiece and freshman Sean Maguire was immense in goal, stopping 44 shots and keeping BU in the game early on. Terriers advance to the Hockey East title game to night against Lowell, a 2-1 winner over Providence. Puck drop is at 7 p.m. with NESN and NBC Sports Network both airing the game. The Eagles, winners of the past three Hockey East tournament championships, came out fast--clearly a step faster than BU--and attacked the Terrier net. BC. Aided by three BU penalties, they out shot the Scarlet 18 to 7 in the first period, but Maguire's magic held them at bay until a late-in the period power play goal that deflected off Garrett Noonan and over the netminder's shoulder. BC continued to control play early in the middle stanza and doubled it's lead when a slick passing play found Eagle Quinn Smith in front of the BU crease and a perfect deflection beat Maguire. The turning point of the game came thanks to yet another standout individual effort by Rodrigues. The sophomore winger took a pass near his own blueline, used a spin-move to get through center ice and then a toe-drag to give himself an open shot which he lasered past BC's Parker Milner. Two minutes later, BU knotted the scored on Matt Lane's unassisted goal. He grabbed a loose puck just outside the BU blueline, jetted into the BC zone and beat Milner five-hole. Then late in the period, with BU on a power play, Matt Grzeylcyk found Noonan for a backdoor goal that gave the Terriers a lead they'd never relinquish. Just a minute into the third period, BC's Johnny Gaudreau took a five-minute major and O'Regan made the Eagles pay with a turnaround shot for the high slot for a 4-2 lead. The Terrier freshman cashed in another man-advantage opportunity, converting after the rebound of Matt Nieto's slapper was pried free by Ryan Santana. BC closed to 5-3 with six minutes remaining on a Steve Whitney tough-angle goal. Three minutes later, the Eagles, already on a power play, pulled their goalie for a 6-4 man advantage, but Rodrigues foiled that strategy. Hustling to a loose puck on the sideboards of the BU zone, he backhand the puck the length of the ice into the open net and then punctuated the moment with a celebratory leap into the Terrier bench. ► For Jack Parker, what was very likely his final game coached against BC, its was win #897, giving him book end victories over the Eagles for his coaching career. The first came on Jan. 18, 1974, an 11-2 win at Walter Brown Arena. 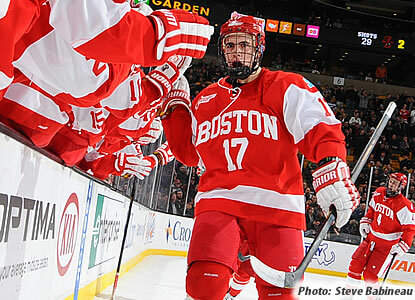 ► The victory also brings BU's overall record vs. BC in Hockey East tournament games to 9-3. ►With seven of eight underdogs producing upsets on semifinal Friday, BU’s chance to earn an at-large spot in the NCAA tournament vanished; the Terriers need to defeat Lowell to earn the Hockey East auto-bid. ►It was a big night for former Georgetown Raider players. In addition to Rodrigues' heroics for the Terriers, his junior A teammate at Georgetown, Scott Wilson, produced the game-winner that sent Lowell to the Hockey East title game for the first time in four years. That was 2009 when BU edged the River Hawks, 1-0, on a Brandon Yip goal, as the Terriers went on to win the national championship. ►Hockey East released a preliminary schedule of conference games for the 2013-2014 season when Notre Dame joins becomes the 11th conference team. 2013 recruit Doyle Somerby scored his first USHL goal in Muskegon’s 4-1 win against Chicago. Somerby joined the Lumberjacks after serving as caption for Kimball Union Academy. #3 Terriers defeated Mercyhurst, 4-1,in their NCAA semifinal game behind goals from Jennelle Kohanchuk, Isabel Menard, Kathryn Miller and co-captain Marie-Philip Poulin. Senior Kohanchuk got BU on the board just 13 seconds into the game with her team-leading 24th goal. Menard (photo) doubled the lead a minute into the second period. Miller's second goal of the season and Poulin's unassisted marker, her 18th, doubled the lead before a goal by the Lakers in the final two minutes averted a shutout. Junior Kerrin Sperry stopped 25 Mercyhurst shots. 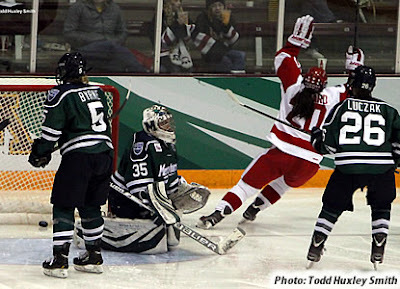 On Sunday BU will take on #1 and top seed Minnesota for the national championship. The Gophers edged BC in overtime, 3-2. With the semifinal victory, the Terriers have set a new program high with 28 wins. See post-game notes below for more about the victory.